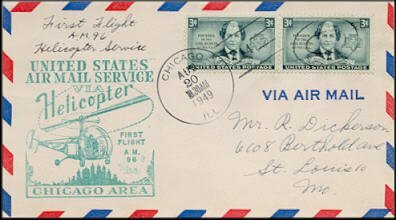 This cover was canceled 20 August 1949 at Chicago to commemorate the start of the first helicopter mail flight (AM flight 96) from downtown to the airport. It is canceled at the Chicago Airport Mail Facility (AMF) on the same day. 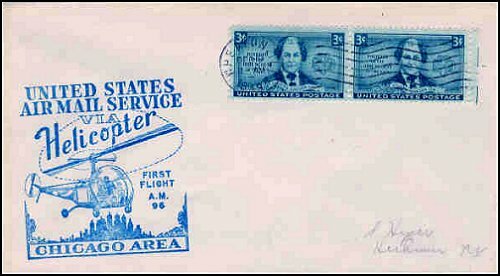 This cover was canceled 19 December 1949 at Weaton, Illinois to commemorate the first Helicopter Air Service helicopter airmail flight from Weaton to Chicago. Backstamped at Chicago on the same day. Only 671 pieces were carried. 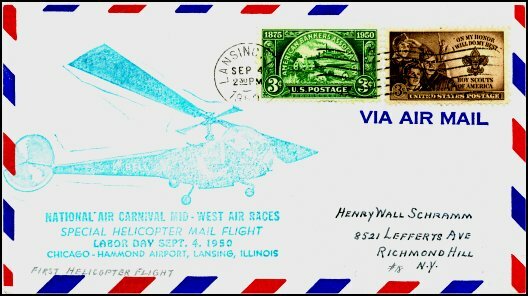 This cover was canceled at 2:30 PM, 4 September 1950 at Lansing, Illinois to commemorate the special helicopter mail flight from the National Air Carnival Mid-West Air Races to the Chicago-Hammond airport. It is canceled only 30 minutes later at the Chicago Air Mail Field (AMF) on the same day.